Supplying a quarter of San Francisco's coal, Nortonville of the 1860s-70s is a flourishing empire in small, seeming to promise unending prosperity and a better future. But beneath the vibrant work ethic of its Welch citizens lies an insidious network of superstitions. A missing boy first brings these dark undercurrents to light. Then young Asher Witherow falls under the spell of an unorthodox apprentice minister, stirring a whirlpool of suspicion and outrage. Soon Asher finds himself trapped in a nightmarish crucible, all the more excruciating because he himself could end it if he could only find the strength of will. This is a lesson the missing boy has taught him, and what he understands instinctively from the alluring Anna Flood, new to Nortonville, who with her raw sensuality and independence seems to offer some hope of redemption or even escape. In this powerful debut from a young writer of stunning talent, M. Allen Cunningham takes us into a time and place at once gritty and magical, when the future seems filled with promise but where the day's labor is bone breaking, numbing and always dangerous. 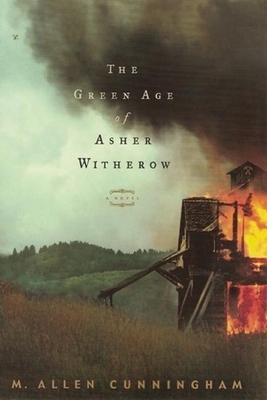 Gorgeously written, historically authentic, The Green Age of Asher Witherow is a novel of tested loyalties, of condemnation and redemption. The characters' deep emotional lives are complex and vivid, fluctuating from the doomed to the transcendent. As he unpacks his heart, Asher comes to realize that all his early traumas have somehow bonded him to the land surrounding Mount Diablo and infused his life with an inward wealth--a treasure at which we can only wonder.